Last week, my husband and I went to dinner, which was the perfect occasion to wear my new floral Boden dress and bracelet from Les Georgettes by Altesse. This particular dinner happened to be about eight courses, which is not only a lot of food but also takes a considerable time to eat, especially when it's a weekday and you basically just want to go home, put on your PJ's, and get into bed! Although I might complain about the calories and the time sacrifice, it was really a lovely dinner. Speaking of lovely things, one of the things that I adore about this Les Georgette bracelet is that it's made in France, so the craftsmanship is excellent. Additionally, the company offers a unique design concept: all of their bracelets feature an interchangeable, reversible band that comes in different materials and colors. I chose leather and am showing here the red side, which matches my dress. The other side is a lovely blue and I only realized later, after the sun had set and I had finished a cocktail, that it would also match my outfit perfectly! Had I realized this sooner, I would have taken some additional pictures with this blue side showing. As you can see, the reversibility aspect of the bracelet makes it incredibly versatile and a fun way to change up the accessories in your wardrobe. 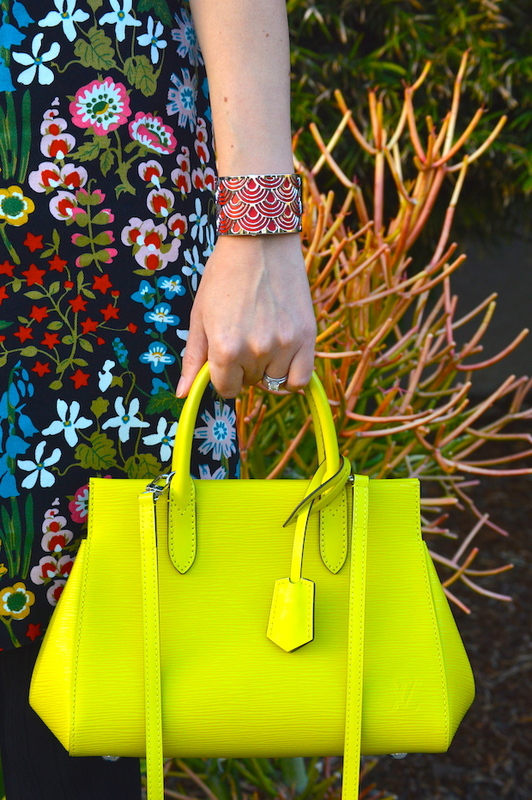 It also adds a lovely pop of color to any outfit, not that this particular dress needs any more color, but, then again, one can never have too much color! Of course, one could also wear the bracelet without the color insert for a more subdued look. Truly, though, this bracelet, regardless of configuration, will go with any style, mood, or occasion, just as they say on the Les Georgette website. I am definitely going to be doing a followup post on it where I will reveal the lovely blue reverse side of the leather strap, so stay tuned! Nice choice of colors! This look is really cute and fun for a day out! Goodness, this dress is beautiful! 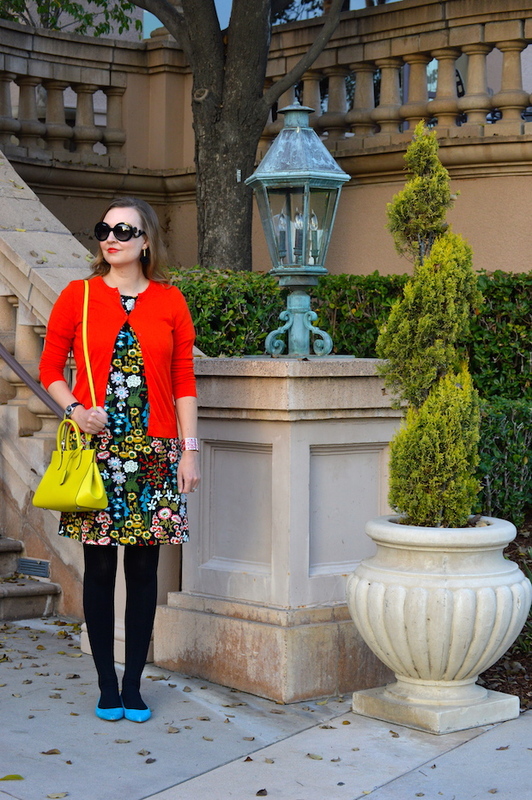 I Love the mix of bold colors. The dark tights with your blue shoes are perfect. 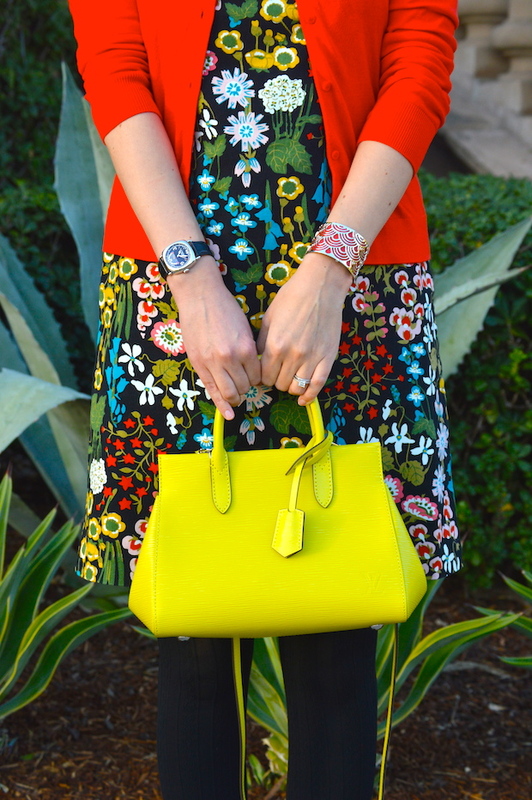 Love this outfit so nice and colorful! I absolutely love that dress; the colors are so amazing!